Articulated truck and trailer length is 16.5 metres and road trains are allowed up to 18.75 metres. The maximum width for all is 2.55 metres. 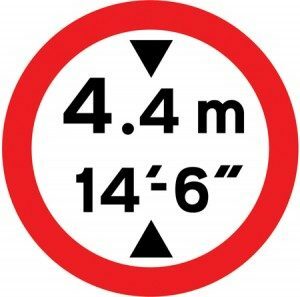 If a vehicle has an overall height of 3 metres or above, a notice is required must be displayed in the cab showing its full height. Vehicle categories on driving licences can depend on the weight of the vehicle – the different terms you might see are explained below. The unladen weight of any vehicle is the weight of the vehicle when it’s not carrying any passengers, goods or other items. 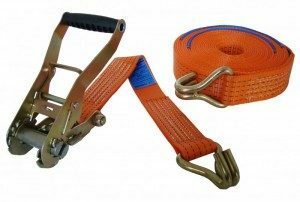 It includes the body and all parts normally used with the vehicle or trailer when it’s used on a road. It doesn’t include the weight of the fuel or, if it’s an electric vehicle, the batteries. Maximum authorised mass (MAM) means the weight of a vehicle or trailer including the maximum load that can be carried safely when it’s being used on the road. This is also known as gross vehicle weight (GVW) or permissible maximum weight. It will be listed in the owner’s manual and is normally shown on a plate or sticker fitted to the vehicle. The plate or sticker may also show a gross train weight (GTW), also sometimes called gross combination weight (GCW). This is the total weight of the tractor unit plus trailer plus load. AXLE WEIGHT : The total weight transmitted to the road by all the wheels on one axle. GROSS VEHICLE WEIGHT : The weight of a vehicle and its load. TRAIN WEIGHT : The weight of a vehicle, a trailer and its load. PLATED WEIGHT : Either the design weight limit given on a manufacturer’s plate or the legal weight limit given on the Department’s plate. TRAILER : Any vehicle drawn by a motor vehicle. DRAW-BAR TRAILER : A trailer pulled by a rigid vehicle. Know the weights of your vehicle and load. If possible, weigh the vehicle to establish individual axle weights. Re-Distribute your load appropriately after any drop-offs to avoid overloading axles. Check the Gross Vehicle Weight before setting out, either using your own weighbridge, or one nearby. You are allowed to drive to the nearest available weighbridge to check your load and then go to a place where they can take off some of the load if the vehicle is overloaded. Do not automatically trust declared weights, invoices or delivery notes given to you by customers. 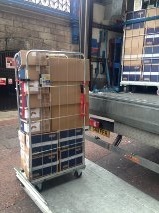 Remember that you hold the responsibility for not overloading, not the customer. Remember that the GVW and GTW include the weight of the vehicle, load, trailer (for GTW) driver and any passengers. Also allow for the weights of any pallets or packing cases. The GVW is the maximum permitted weight of the vehicle (plus any load it is carrying), while the GTW is the maximum permitted weight of the vehicle plus any trailer being towed. It makes the vehicle less stable, difficult to steer and take longer to stop. 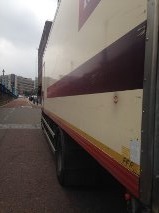 Vehicles react differently when the maximum weights which they are designed to carry are exceeded. The consequences can be fatal. Massive strain is put on vehicle tyres. Overloading can cause the tyres to overheat and wear rapidly which increases the chance of premature, dangerous and expensive failure (such as blow outs). Insurance cover is void. Overloading a vehicle is illegal and therefore insurance cover can be voided if the vehicle is involved in a crash. It causes excessive wear and damage to roads, bridges and pavements at the expense of the tax payer. It is unfair on other operators. Exceeding weight limits is unfair competition as more load is moved per journey. If you’re responsible for transporting an abnormal load, you need to follow regulations for notifying the authorities. A load that projects more than 2 metres to the front or rear of the vehicle must be fitted with an end marker. Side markers must be displayed if the front or rear projection exceeds 3 metres. An example of the types of load restrain used along with the load. Each load can be different and common sense must be applied when securing a load. As the driver it is your responsibility.